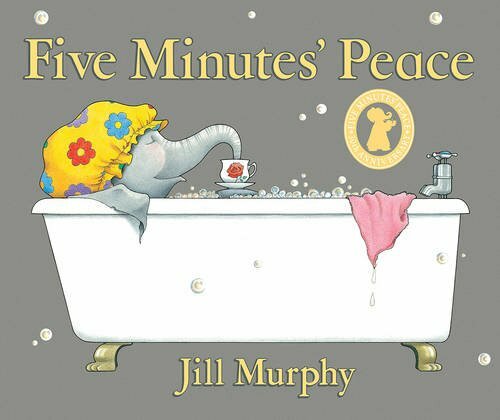 Can you believe it's 30 years since Jill Murphy's picture book classic Five Minutes' Peace was first published? Now a modern classic, it's just as funny and accurate a portrayal of family life as when it first came out. Time-poor mum Mrs Large just wants a few minutes of peace and quiet in her hot, foamy, ever so bubbly bubble bath, with her newspaper, a cup of tea in her favourite mug, a plate of toast and a tempting cherry-topped cupcake! But with Lester, Laura and the baby being as bouncy and boisterous as ever, Mrs Large finds her peace to be very short-lived. In fact she manages a scant three minutes and forty-five seconds! To celebrate the 30th anniversary, we've made a stunning special edition of the book which is gorgeous! You can pick up a copy in your local bookshop. As we count down the days to Mother's Day, we'll be celebrating 'me time' for mums with five of our favourite mummy bloggers. Follow the tour for activities, reviews and giveaways and to see how the next generation of children respond to this classic picture book. Join in the fun and check out our Five Minutes' Peace free activity sheets. We're giving one lucky winner the chance to win a Five Minutes' Peace pampering kit, including £100 Treatwell vouchers to spend on spa treatments of your choice, plus a signed edition of Five Minutes' Peace, relaxing tea, bath salts, candles, and chocolates! Five runners up will receive a signed copy of Five Minutes' Peace. To enter, just email competitions@walker.co.uk with 'Pamper' in the subject line and let us know how YOU would spend five minutes' peace! Competition closes 18th March 2016. Terms and conditions apply.